The new term is upon us! We’re all very excited that the new University term is about to begin. Yesterday, the boy trebles were fitted with their cassocks (a regular task as they are very good at growing taller in the vacations!) and our new probationers learned how to put them on, not an easy task in a double-breasted cassock! On Thursday of Freshers’ Week we have our Welcome Service with great hymns for all to sing. All Freshers have been sent invitations, and everyone has a copy of the Chapel termcard (and there are over seven hundred pigeonholes in College!). On Friday we welcome staff and friends of Christ Church Cathedral School, where our boys are educated, to a service of Choral Evening Prayer (5.45 pm so that it’s just after work). 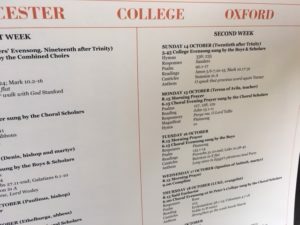 On Saturday 6 October we will have an Open Rehearsal and Evensong for those who are interested in joining the Choir as a Choral Scholar — there are still a couple of vacancies for this year. 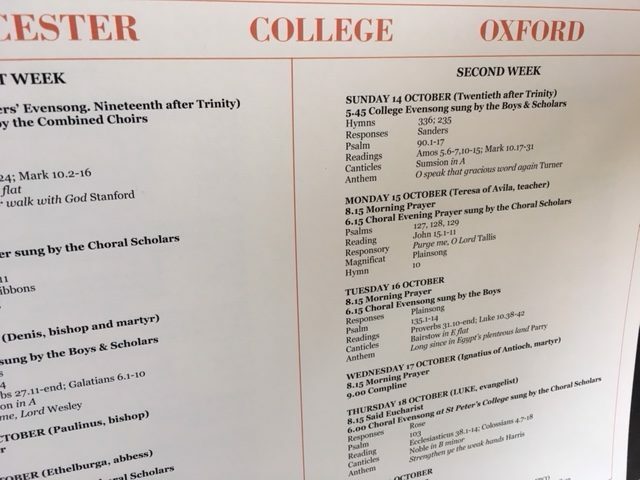 Finally, on Sunday 7 October (the beginning of First Week) we have Freshers’ Evensong together with the admission of choristers and other new people in the Chapel. Thereafter the regular service pattern will begin! You can see the music list for the first half of term here.